This dramatic condo has a fabulous corner location and private roof deck that makes the most of the views of the Gulf and the spectacular Pointe Santo grounds and lagoon. Fully remodeled and professionally redecorated to luxury standards. Complete with everything including a fully equipped kitchen, four flat-screen TVs, DVD/CD stereo and washer/dryer. The living room has a high-definition plasma TV, Bluray disc player and Bose surround sound system. The master suite has a king bed, whirlpool tub and double walk-in shower. The guest suite has two full-size beds and a walk-in shower. The office nook has a PC with flat-screen display and color printer, cable modem for high speed Internet access, and wireless and wired connections for guest PCs. Pointe Santo's tropically landscaped grounds include swimming pool, hot tub, tennis, gas grills and a range of staffed children's activities. With one of the best beaches on Sanibel, it is the ideal location to enjoy the Gulf and collect shells. It is close to several golf courses as well as fabulous restaurants, shops, boating, and fishing. 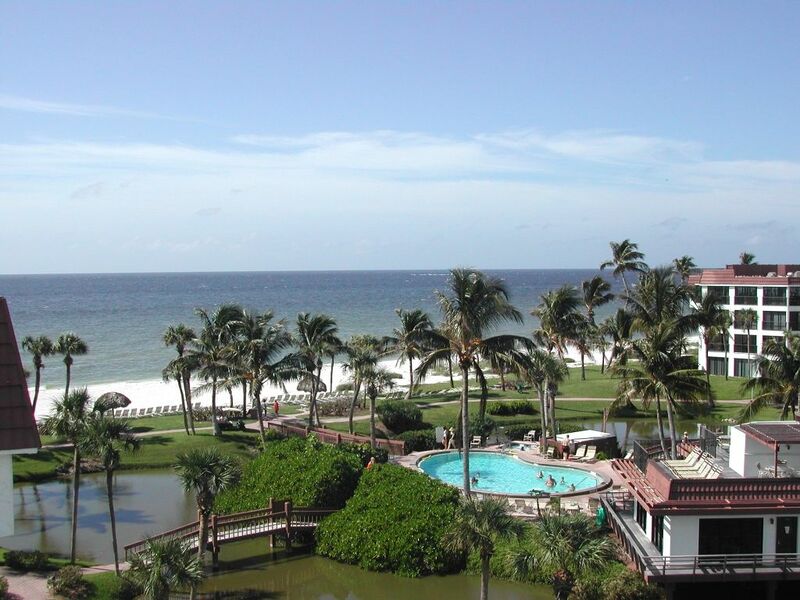 Sanibel Island is the ideal family vacation spot. 28 miles of bicyle paths criss-cross the island and run right past the Pointe Santo complex. The famous 'Ding' Darling Wildlife Refuge is nearby. Visit our website under 'Links to more information' below to view more photos, descriptions, and floor plan. Prefer a Beach-Level Condo in Pointe Santo? See VRBO #170782 for our luxury beach-level condo. Gorgeous granite kitchen, fabulous beach location, new tropical furniture, PC & printer, flat-screen tvs, and so much more! You won’t want to leave. We love Sanibel Island. It's quiet, peaceful, and laid back. Half the island is nature preserve. There are no high rises or chain restaurants. The beach is beautiful and uncrowded--and the best shelling anywhere. You cross the causeway to the island, and you feel like you're in a different world. We visited and stayed in rental condos many times before buying at Pointe Santo. It's at the southernmost point on the island with a wide sandy beach. Pointe Santo is very 'family friendly'--with four grown children and three grandchildren, that was very important to us. The grounds are beautifully maintained, and we love to walk around and look at the flowers in bloom. In early 2005 we rented one of the condos, saw an 'Open House' sign, and bought a condo before we left. Now our family owns two Pointe Santo condos - penthouse D-47 (VRBO 1682) and beach-level E-2 (VRBO 170782). We stayed during the Christmas week. The condo was beautiful and spacious. The beds were very comfortable. We loved the roof top deck. The owners contacted us when we arrived and let us know about the farmers market. Don't miss it! The owners have provided everything you need (beach chairs, beach umbrella, beach towels and beach toys). The location was wonderful. We rode bikes around all week from this place. Thank you for sharing your condo! We had a wonderful week at Pointe Santo! This was our first visit to Sanibel Island. It was one of the best vacations my wife and I and our seven year old daughter have had as a family. The condo and property had a lot to do with our experience. Tastefully decorated, clean, well maintained and well appointed. We couldn't have asked for anything better, it really felt like a home away from home. The owner was great. He even called to make sure everything was to our liking and gave us recommendations on restaurants, things to do and places to visit. The owners even had towels and chairs to use at the beach and pool/beach toys for our daughter to use. We really enjoyed our stay. Thanks for your lovely review, Ted. Hope you'll come back again soon! We enjoyed a great week at this lovely condo on the beach. The owners have done everything possible to make this a beautiful and welcoming retreat. The decor and layout are outstanding. They’ve supplied every item imaginable that you might need or want, even three different ways to brew your morning java, all with instructions! The views from the screened patio and the penthouse deck are gorgeous as well, and both have comfortable furnishings for guest’s enjoyment. The Pointe Santo complex is a bit reminiscent of a Disney resort (in all the good ways) - beautiful well-manicured grounds, a lovely common area with pool and club house, and lots of friendly staff. The beach is steps away and the widest part is right in front of you. We came in with sub-tropical storm Alberto and the only beach remaining to walk on with the high surf was at Point Santo. All in all, the perfect place to spend our 40th wedding anniversary. Thanks Dave and Sandy for sharing your little slice of heaven with us! Couldn't ask for more in your review, either :-) Delighted our condo and Pointe Santo worked well for your 40th -- and glad Alberto didn't spoil it. The Pointe Santo beach is really special. Very comfortable and well maintained! The rainy season came on time this week/year but it didn’t dampen our spirits. The condominium was a great place to spend time when we were not out seeing site and enjoying restaurant. Very nice accommodations! We consider using again. This does not feel like a rental...it feels like home! The owners of this wonderful condo unit have thought of everything to make your stay enjoyable. From the placement of the shower handle (so that you don’t have to stand under cold water when starting your shower) to the “take some, leave some” cabinet, no detail is too small to overlook. Comfortable furnishings, top shelf appliances, every cooking utensil you could need (and many you won’t) quality beach items....just bring yourself and an extra bathing suit and everything else is taken care of. Thanks for the lovely review, Dave. I think you're the first person to comment on the placement of the shower handles -- that was important to us when we remodeled the condo. Hope you'll come back to stay with us again! This is truly a well thought out condo in a beautiful setting. Every detail is perfect. It was a great set up for the three of us. Every thing you could possibly need is provided for you. The owner came over to personally greet us and made sure we were comfortable with everything. Thanks, Dave! Looking forward to our next visit! Thanks for the nice review, Diana. We're looking forward to having you come stay with us again. Because we live on the island full time just five minutes from Pointe Santo, we can take care of the little details whenever needed. All rentals are Saturday to Saturday. All rates include cleaning and linens. Please no smoking or pets.